Paris-born Olivier Barlet is a member of the Syndicat français de la critique de cinema. He is in charge of the Images plurielles collection on cinema for L'Harmattan Publishing House. His book entitled "Les Cinémas d'Afrique Noire : le regard en question" (L'Harmattan 1996), won the Prix Art et Essai 1997 from the Centre National de la Cinématographie and has been translated into English under the title "African Cinemas, Decolonizing the Gaze" (Zed Books, London), as well as into German and Italian. His last book is entitled Les Cinémas d'Afrique des années 2000: perspectives critiques(L’Harmattan, Paris, 2012), translated into English: Contemporary African Cinema (Michigan State University Press, 2016). 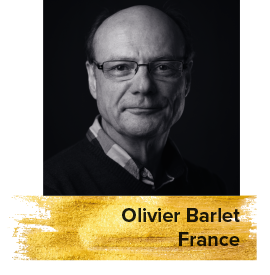 Olivier Barlet is now Editorial Director of Africultures, an African cultural journal that features a paper edition as well as the free magazine Afriscope and the website africultures.com, where he has written 1700 articles on African film.